178 pages | 17 B/W Illus. Assessment in Second Language Pronunciation highlights the importance of pronunciation in the assessment of second language speaking proficiency. Leading researchers from around the world cover practical issues as well as theoretical principles, enabling the understanding and application of the theory involved in assessment in pronunciation. Discussion of current and future practice in assessing pronunciation via speech recognition technology. Assessment in Second Language Pronunciation is vital reading for students studying modules on pronunciation and language testing and assessment. 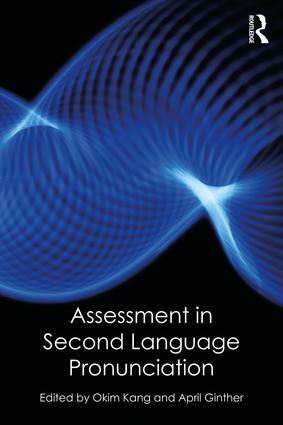 "This volume revitalizes the field of second language pronunciation assessment, offering new and diverse scholarly insights on features of pronunciation and how these are perceived and evaluated by listeners and trained raters, on the challenges to test validity posed by shifting pronunciation norms, and on technological advances in measurement. Essential reading for pronunciation researchers, professional language testers and graduate students of language assessment, the book will also be illuminating for ESL teachers and applied linguists more generally." Okim Kang is Associate Professor of Applied Linguistics/TESL at Northern Arizona University, USA. April Ginther is Associate Professor of Second Language Studies at Purdue University, USA.